A attendant (cf. the Homeric ὀπάων), S.Tr. 1264 (anap. ), E.Alc.136 ; of body-guards, A.Supp.985 : c. gen., Πάν, Ματρὸς μεγάλας ὀπαδέ Pi.Fr.95 ; ἀοιδὰ στεφάνων ἀρετᾶν τε . . ὀ. Id.N. 3.8 ; τέκνων ὀ., of a παιδαγωγός, E.Med.53 ; πυκνοστίκτων ὀ. ἐλάφων pursuing them, of Artemis, S.OC1093 (lyr.) ; ἀστέρες . . νυκτὸς ὀ. Theoc.2.166 ; τὴν Ἑκάτην ὀπαδὸν Ἀρτέμιδος εἶναι Phld.Piet.91, cf. 33. II as Adj., c. dat., following, accompanying, attending, ἐγὼ Μούσῃσιν ὀπηδός h.Merc.450 ; πτεροῖς ὀπαδοῖς ὕπνου κελεύθοις following the ways of sleep (ὀπαδοῦσ' following on wing the ways of sleep, cj. Dobree), A.Ag.426 (lyr. ); σταγόνα σπονδῖτιν, θυέεσσιν ὀπηδόν AP 6.190 (Gaet.).—Poet. word, used by Pl.Phdr.252c, Phlb.63e, and in late Prose, Phld. (v. supr. ), Plu.Alc.23, Jul.Or.4.157a (ὀπηδός Ant. Lib.7.7). [Seite 356] ὁ, ion. u. ep. = ὀπαδός, Hom., s. oben. Meaning: attendant (h. Merc. 450, late prose). Derivatives: ὀπηδέω, ὀπαδέω to attend, to go with (Il., -εύω A. R.) with ὀπάδησις f. attendance (Criton ap. Stob. ), ὀπηδητήρ σύνοδος, ἀκόλουθος H.
Etymology: As ὀπηδός can hardly be separated from the synonymous ὀπάων, one thinks of an anlysis ὀπη-δός (ὀπ-ηδός? ); such a formation, esp. of a nom. agentis, is however unknown (but several in -ηδών). Against direct connection with ὀπάζω (ὀπαδός backformation? 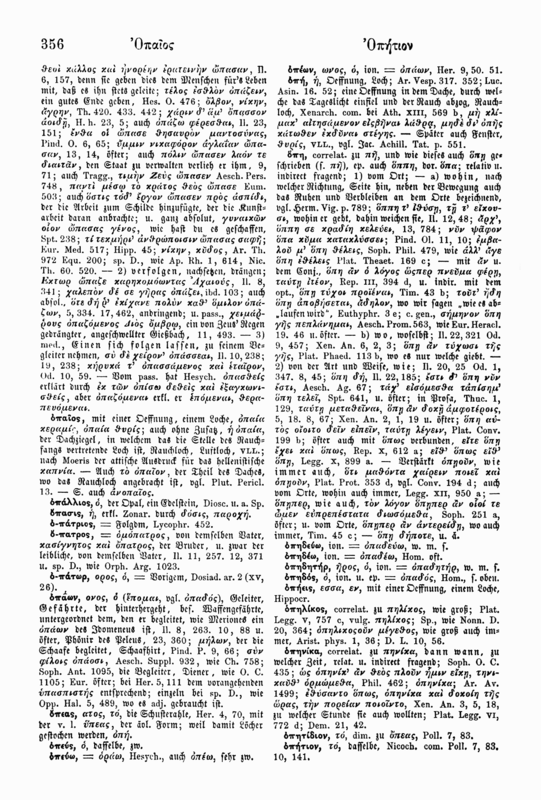 ; suggestion of Kronasser in Haas Μνήμης χάριν 1, 132) speaks the diff. quantity of the vowel; not better Prellwitz Glotta 19, 98 after Bezzenberger BB 24, 321: *ὀπαδ old abl. of *ὀπά f. followers, suite. -- Perhaps with Sapir Lang. 10, 274ff. a.o. from Hitt. ḫapatiš obedient, subject, servant, s. Schwyzer 508 n. 6, Neumann Heth. u. luw. Sprachgut 19. This would mean a loan from a foreign language; so it could as well be Pre-Greek. - On ὀπάων, ὀπαδός in trag. Björck Alpha impurum 109 f. Older attempts in Bq. This page was last edited on 3 January 2019, at 07:12.